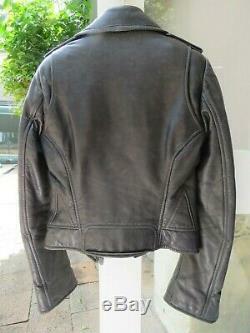 Beautiful Authentic 2010 Balenciaga Moto Leather Jacket in Dark Grey agneau (lambskin) leather with grey zips & hardware. This item is guaranteed 100% authentic. 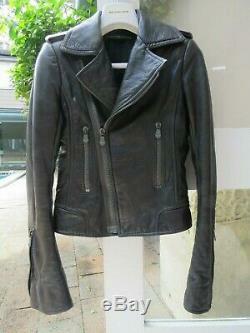 Amazing leather jacket which is a must for any fashionista's closet, as worn by the elite of the fashion world & many celebs. The style is fitted, this particular season does run slightly small in comparison to other seasons, so please keep that in mind. I personally would feel that this jacket is suited to a Size 6-8 Australian, and for a true Size 36 French. 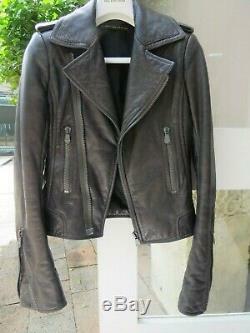 This jacket suits any occassion as it works equally as well casually or dressed up, with jeans or with a dress / skirt. It is most often worn unzipped (& looks much better that way in my opinion). Please view pics to see the condition. 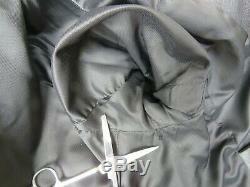 There are some small tears to the lining at both armpits (see pics) which is not uncommon with these jackets. This jacket is preowned & has seen a little use, but has many years of enjoyment left in her. The leather is already super soft, and she will age beautifully & become even more soft & supple as she is enjoyed. 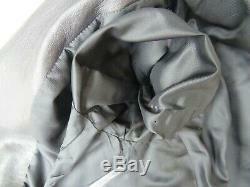 Dark Grey (from memory this colour is known as Tempete) from the Balenciaga 2010 collection. Colour is deep, rich & saturated, with a beautiful subtle sheen. 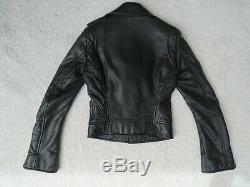 The leather is silky smooth & thick, slightly distressed, soft, puddly, & beautiful to touch. This season produced the limited edition & very chic grey zips & hardware, which match in beautifully with the grey leather. 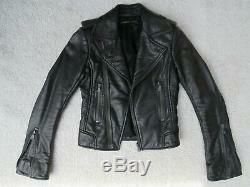 Size 36 (French Sizing) - please note that this jacket is an all over fitted style. This season also runs slightly small in my opinion, so please keep that in mind especially if you are between sizes. For me as far as correct fit is concerned, I have found the most important moto measurement to be the shoulder seam width. Size 6 - 8 (Australian Sizing) equivalent. 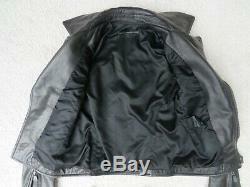 Good - this jacket has seen a little use, but overall is still in good pre-owned condition. All over wear including slight fading & fingernail scratches, but these really just add to the vintage biker look that this jacket is designed to give. 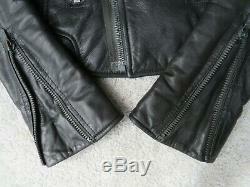 No holes or tears to the leather, ends of sleeves are in good condition, & all zips work fine. Price is indicative of the condition of this jacket & this price is an excellent deal for the original style iconic Balenciaga Moto. Just the jacket (Balenciaga hanger is not included I'm sorry). Taken with the jacket zipped up. 15 inches - Shoulder (across the back from one shoulder seam to the other). 25 inches - Sleeve length (from cuff to shoulder seam). 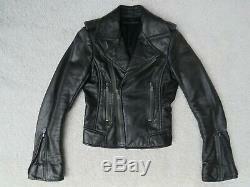 16 inches - Armpit (straight across from one armpit to the other - with the jacket zipped). 14.5 inches - Across the bottom (straight across the bottom of the jacket). 21.5 inches - Total Length (down the centre, from top of collar to bottom of jacket). 18 inches - Length (down the side, from shoulder seam to bottom of the jacket). Please view pictures as these form part of the description & feel free to ask for any further pics. Or ask any questions which I will be happy to provide. 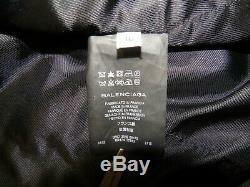 The item "Auth 2010 Balenciaga Moto Leather Jacket Dark Grey Lambskin Sz 36 Fr / 6 8 Aus" is in sale since Sunday, March 24, 2019. 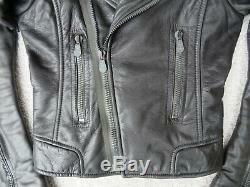 This item is in the category "Clothing, Shoes, Accessories\Women's Clothing\Coats, Jackets & Vests". The seller is "retale_therapy" and is located in Sydney. This item can be shipped worldwide.